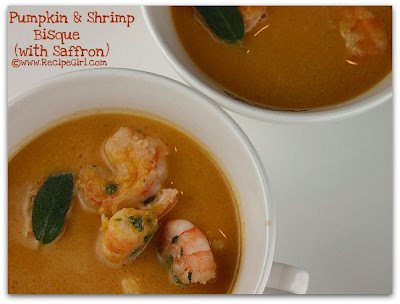 The Recipe Girl: Playing with Saffron & Lavender... and a Gourmet GIVEAWAY! 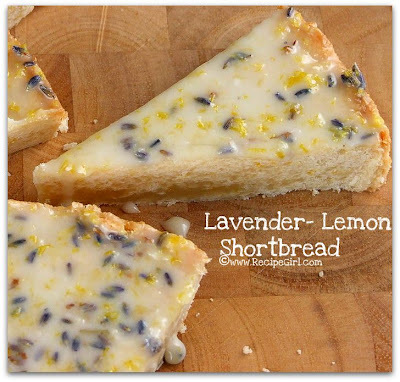 Playing with Saffron & Lavender... and a Gourmet GIVEAWAY! My husband was at Starbucks on a business trip recently and ordered a Mocha. When he reached into his pocket to pay, the cashier told him it was taken care of. "Really?" he asked. "By whom?" The cashier pointed to an older lady standing off to the side. My husband approached the woman and thanked her. "That's so nice of you," he said. "But why would you buy my drink?" The woman explained that the Good Lord says to be good to others, so once a day she always pays for the drink of either the person in front of her or behind her in line. My husband was flabbergasted. "Well... what can I do for you?" he asked her." She told my husband that his smile was all she needed, and then she walked away. My husband was so touched by this selfless act... that we live in such an impersonal society where people are on cell phones and keep to themselves, and to experience such a random act of kindness was just so refreshing. I've never had something quite like that happen to me. I receive a lot of emails from people who want to send me things. Sure, I'm aware that their intent isn't a random act of kindness... that they'd probably like me to discuss their product on my blog, but I don't generally accept things from those who offer unless I genuinely believe that it's a product I would use. I received a rather nice email several weeks ago from Andrew at AJ Gourmet Foods. I checked out his gourmet website and was pleasantly surprised with what I found... olives, capers, various spices, olive oils, etc. I would use this stuff! So Andrew sent me a generous package of samples... along with a couple of gift baskets for giveaways. He realized that he had forgotten to send me one of the spices I had asked about and even sent that along later. It really all was quite delightful. And even more fun was that the packages arrived during the week of my birthday. 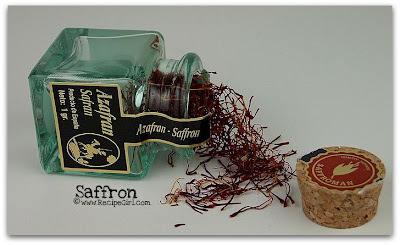 First, I played with this darling, corked bottle of saffron. I've only made a few things in my lifetime with this uber-expensive spice, so I was delighted to get a fresh bottle and use a pinch of it for a Pumpkin and Shrimp Bisque. This was one yummy soup. It had a velvety texture and a great homemade flavor. The addition of shrimp was unique for a pumpkin soup... a good pairing. Next, I played with dried lavender. Funny... 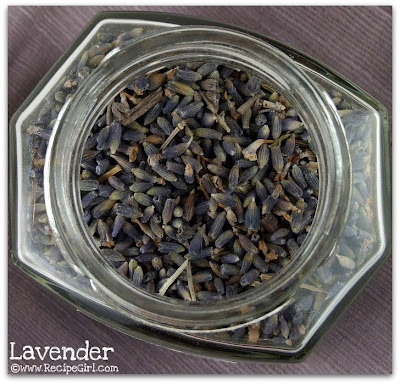 I have lavender growing in my backyard, but I've never thought to use it in a recipe. First I tried a recipe for Lavender Chocolate Chip Cookies that I found on some random site on the internet. Let me just say that lavender does not belong in chocolate chip cookies. I took one bite and threw away the entire batch of flowery-tasting cookies. Ick. I wasn't ready to give up, so I decided to try it out again in Lemon Shortbread with Lemony- Lavender Icing. Much better! This was delicious (and pretty!) I think you have to have a fondness for lavender to enjoy them, but the shortbread itself was delicious and the icing was perfect. I brought these to a neighbor's house for a party and the husband called the next day to tell me that he was in love with my shortbread. Now for the giveaways... ! 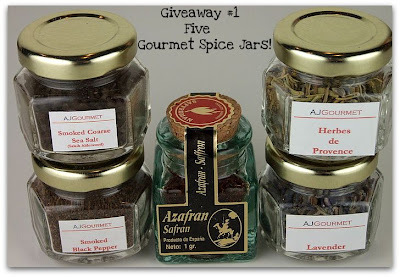 #1: Wonderful samples of AJ Gourmet Spices: Smoked Course Sea Salt, Smoked Black Pepper, Saffron, Herbes de Provence and Lavender. Cute, aren't they? 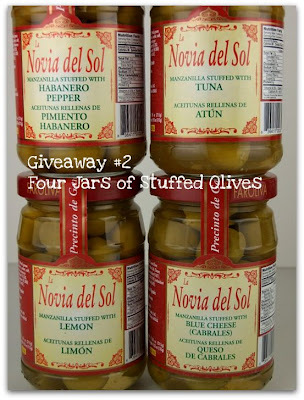 #2: Four jars of AJ Gourmet stuffed gourmet olives. I didn't get to try these out, but they look amazing! All you have to do to enter these giveaways, is to comment on this post by Friday, Nov. 21st at midnight Pacific time, and tell me something nice that you've done for someone lately (it can be anything, really). And if you'd like to specify which giveaway you'd rather have, go ahead and note that too. The winners will be chosen randomly, but I would love to hear about all of the kind acts that have been taking place in our crazy world. You must live in the US for these giveaways... I love my international blog visitors but it would simply be too expensive to mail these to you! And if your comment won't lead me to find you... please include your email address . Be sure to check out AJ Gourmet Foods for additional details on these and other goodies (they have gift baskets for your foodie friends for the holidays), and good luck to all! Thank you Andrew for the giveaway items! This contest is now closed... and the winners are posted here! The Lemon Shortbread with Lemony- Lavender Icing recipe can be found HERE. The Pumpkin and Shrimp Bisque recipe can be found HERE.